I am not a morning person. In my early days as a yoga practitioner I would will myself into x number of sun salutations or some power yoga routine in hopes to get my energy up in the morning, but inevitably ended up exhausted afterwards. And who wants to be exhausted at the start of their day? When my teacher suggested that I do a short calming yoga practice in the evening the day before, I was puzzled – how would that give me more energy in the morning? Turned out it did. Here is it how it works. 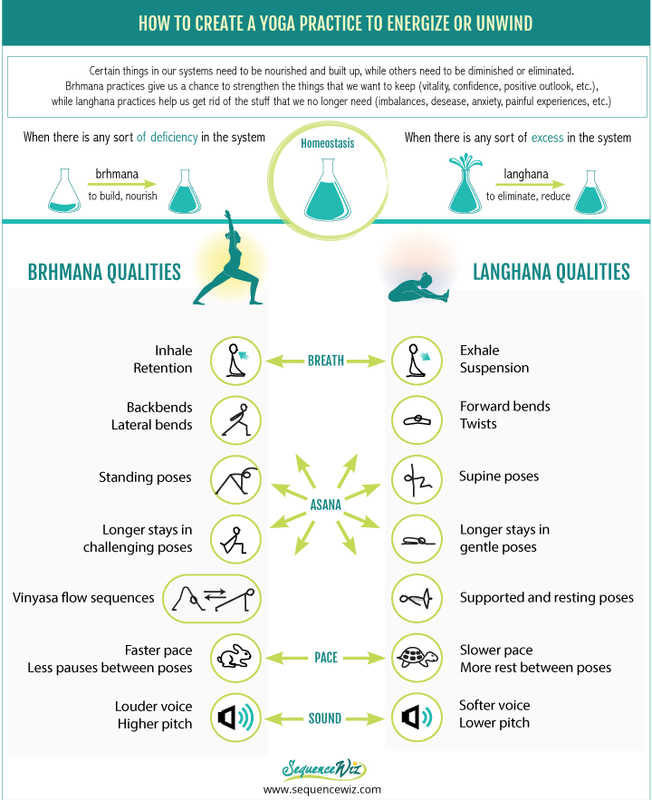 One of the most overlooked and misunderstood ways of working with energy in a yoga tradition is the Brhmana/Langhana model. You probably never even heard the words, yet I bet you’ve been teaching it intuitively for years. It is the main therapeutic tool used by Ayurveda, yoga’s sister science. It basically states that there are two kinds of practices: those that nourish and build the system (brhmana, also spelled brmhana) and those that reduce or eliminate from the system (langhana). So you choose one or the other depending on what it is you are trying to accomplish. You see, both modern science and traditional Ayurvedic wisdom recognize that it is necessary for the body to maintain the state of homeostasis – stable internal environment. Homeostasis functions kind of like a sophisticated thermostat that maintains temperature within set limits – if the room gets too hot, it turns on the air conditioner; if it gets too cold, it turns on the heat. Human body works the same way, maintaining the state of internal equilibrium on the levels of body temperature, fluid volume and composition, waste concentration and blood pressure. There is a constant push-and-pull going on between the opposing forces as the body adapts and readjusts itself to the changing internal and external environment. Simple example: You start doing your power yoga routine – more heat is produced – more heat must be lost (to avoid overheating) – you sweat – you loose water – you drink (to replenish water). This is a juggling act between several physiological systems to keep your vital conditions within normal limits. Both yoga and Ayurveda agree that internal equilibrium is affected not only by physiological processes, but also by the state of the mind. Therefore our state of dynamic balance is also affected by access or deficiency on the level of the mind or emotions. This isn’t rocket science, really; we know that if somebody has too much anger, for example, it will affect both his/her mental state AND physiological functioning (blood pressure, heart rate, breathing capacity, etc). Or if somebody has low energy or lack of confidence, it will change their perception of their own health and vitality. So basically, if you got too much of certain kind of energy (anxiety, agitation, anger, etc.) or got too little (low energy, low self esteem, depression, etc), it will be harder for you to find the state of internal equilibrium. So what do you do? You get rid of the excess and build on deficiencies! See, now you have a new fancy word for those “letting go” classes that you’ve been teaching (langhana) and those “rise-and-shine” practices (brhmana). This doesn’t mean, of course, that if you are teaching a calming practice, that you shouldn’t do backbends, etc. Just certain practices have more pronounced brhmana or langhana qualities, so you would choose MORE langhana elements for a calming class. 1. Breath is the most important part of the equation. If you want to change your energetic state, you need to work with 4 parts of your breath. Asana, pace, sound and other elements only enhance the effect. 2. Don’t expect the same result for everyone. There are many different factors that come into play for each student. Some will have a predictable response, but there is always a possibility of an unpredictable one, too. 3. You have to begin where your students are and take them where they want to go. This is crucial in energy management. For example, in the morning class you would begin with langhana elements to match the students’ energetic state and then gradually build the brhmana elements to get their energy up. Or, if the students come to your evening class buzzing with anxious energy, the last thing you want to do is have them lie on the ground. It’s just too much of an energetic mismatch. Instead you would start with strong brhmana elements and then gradually turn it into a langhana practice. 4. Generally, it is more important to begin with langhana to purify the system and teach it how to eliminate, before you start building. T.K.V.Desikachar: “The ability to lengthen the exhale should be achieved before introducing brhmana, as too much fire without elimination can create disturbing patterns of energy. To receive that which is new (fresh energy), we must first release what is old and no longer benefits us.” That is why an evening langhana practice worked better for me in the past – I had to let go of old stuff before I could make room for the new energy. 5. Brhmana is not the same as a cup of coffee. The purpose of brhmana practice is to nourish the system, replenish its resources. Coffee, on the other hand, stimulates the body and then provokes elimination. 6. Brhmana is not always heating and langhana is not always cooling – heating and cooling is a different way of looking at energy, which we will address in couple of weeks. 7. Remember, those practices have no value of their own – they are meant to make YOUR LIFE BETTER. So use them as tools, not some shrines. If doing a power practice in the morning makes you feel great and gives you energy for the day ahead – fantastic! But if you feel depleted or agitated, then this is not an appropriate practice for you. Do something else! Tinker with your practice (when, what, how long, etc.) and find out what works better. Brhmana/langhana model is very useful for managing our day-to-day energy, but it becomes even more important in a therapeutic context, when we help students deal with complex health issues. For many diseases (and associated treatments) we would need to both purify and strengthen the system. What do you do first? The main question to ask – is the student stronger then the disease? If the student is stronger, then you will need to purify and then nourish. If the disease is stronger, then you would need to nourish first to strengthen the system and then purify later. But this is a much more complex topic that is beyond the scope of this post. Next time we will feature a short langhana practice to help you unwind at the end of the day and a short brhmana practice to help you get going in the morning. Tune in! Log in to your Sequence Wiz account to get the How to Create a Yoga Practice to Energize or Unwind handoutGo to Forms/Handouts on your Sequence Wiz home screen and you will find a pdf file of this handout. It’s yours to keep and/or give to your students.